Summertime always brings invites to barbecues, picnics or potlucks, and usually you need to bring something like a coleslaw or a dessert. 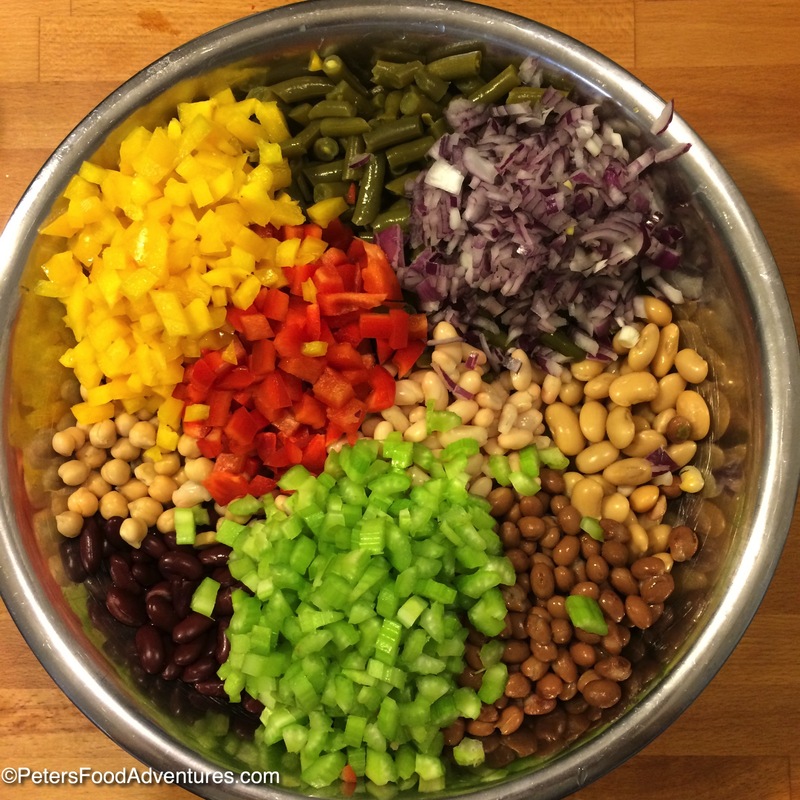 I’ve talked about how I hate potlucks, but I love this easy 7 Bean Salad Recipe. It’s so incredibly easy to make, and so much cheaper and tastier than what is pre-made, ready to buy in the store. This recipe was in my mum’s old recipe book, the one I grew up with that was full of hand written recipes. I chose to make a hearty Easy 7 Bean Salad Recipe, but you can choose to use fewer beans if you like, just keep the ratios of beans correct. Your grocery store might not sell all these beans, or they might have different names depending on what country you live in. For instance, I cannot find canned sliced Yellow Wax Beans here in Australia. No Libby’s or Del Monte Wax Beans in sight! To think of it, Yellow Wax Beans aren’t that common fresh either! This summer, we will have to plant some Wax beans in the garden just to have some! If you can’t find a specific bean, then swap it up a bit with what you have in your supermarket aisle. ie. I had to use 4 cans of Green Beans instead of 2, because Wax Beans weren’t available. You could also buy fresh Green Beans and cook them, but this is an Easy 7 Bean Salad Recipe, so just stick to the cans! 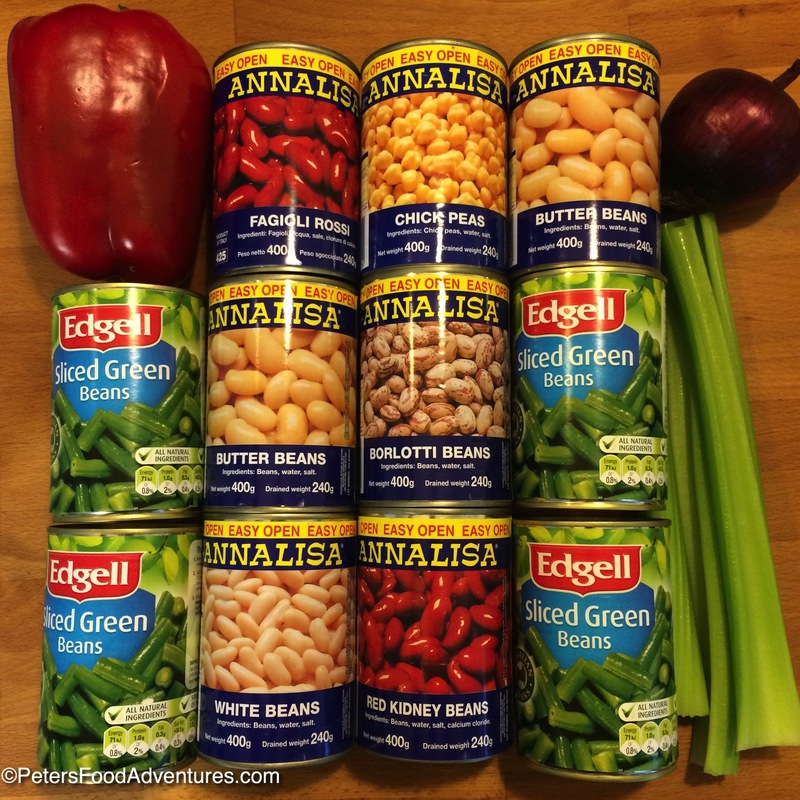 Honestly, you really could almost go to your bean aisle in the supermarket, and pick any canned beans, eenie, meenie, minie, moe….. and this Bean Salad Recipe would work! 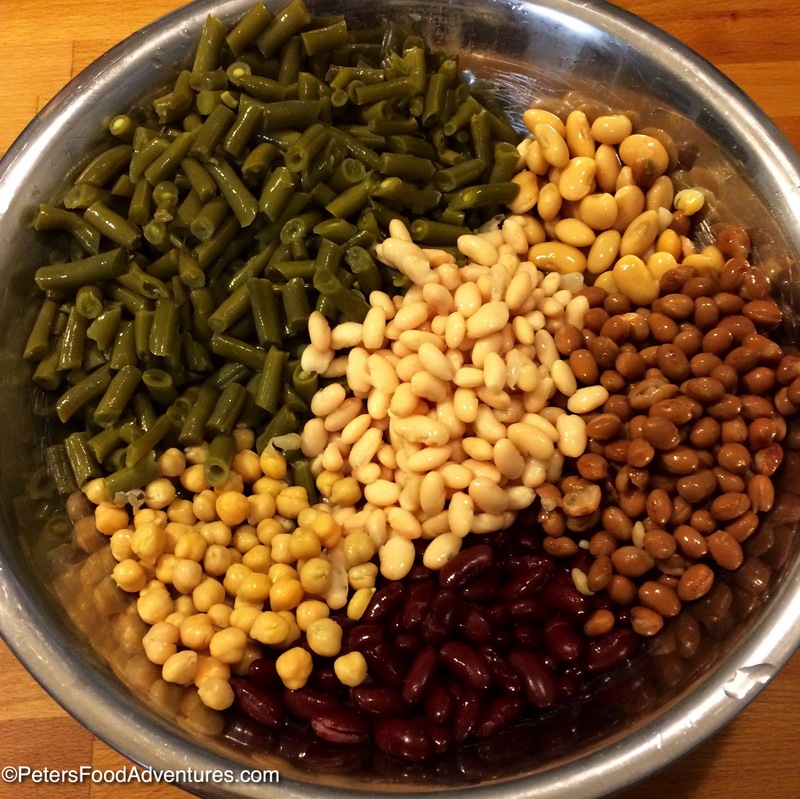 An Easy 7 Bean Salad Recipe is more interesting than a plain 3 Bean Salad seen at many potlucks and bbqs, and much tastier. This is a very generously large salad that feeds many. It’s perfect to bring for large dinner or potluck, to show off your salad skills, but don’t tell them how easy it was! Bon Appetit! Приятного аппетита! 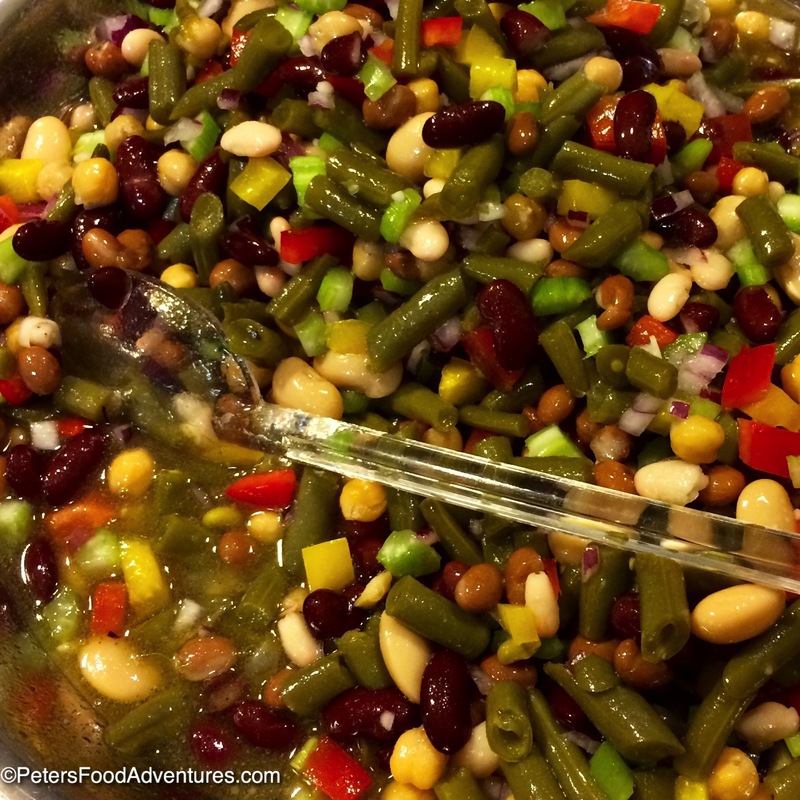 An Easy 7 Bean Salad recipe perfect for large potlucks, church events, bbq's or summertime gatherings. Looks and tastes amazing! Over a colander in the sink, drain the cans of beans and rinse well with water. Put the beans in a large bowl. Add the onions, red pepper, yellow pepper and celery. In a separate container, mix together the vinegar, sugar, mustard powder, salt and pepper and stir until the sugar dissolves. Add the oil and mix. Add the dressing to the bean mixture and toss gently until well coated. 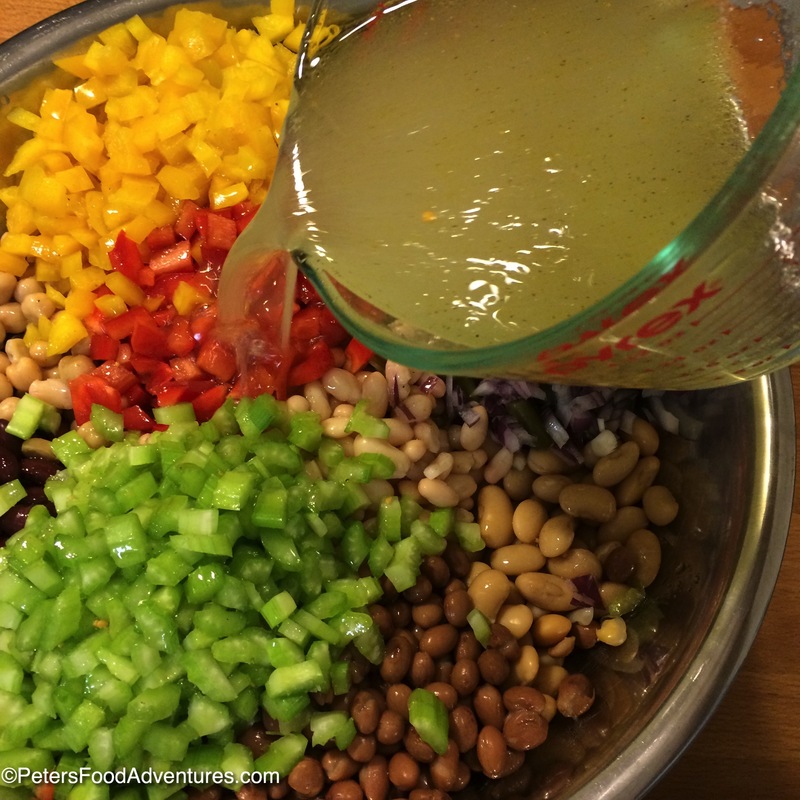 Refrigerate for at least 4 hours to allow the dressing to soak the into the bean salad. Best if you allow to marinate overnight in the fridge, mixing occasionally. yes I love this type of salad and so I think yours sounds great! WOW. look at all the different beans! I make this all the time but I have never mixed so many beans. That is so grand!